You couldn't say that Man in a Case, at ArtsEmerson through this weekend only, isn't interesting - indeed, it's fascinating in spots. With dance legend Mikhail Baryshnikov at its center as a kind of celebrity drawing-card, this movement-multimedia-spoken-word amalgam (from New York's Big Dance Theater, although it premiered at Hartford Stage) is a high-tech, yet resolutely down-town, take on two Anton Chekhov stories, the sardonic "Man in a Case" and the more-famous "About Love." And as I said, it's - interesting. But in the end you may sense that what this talented company has put together doesn't have all that much to do with these classic stories - or with Chekhov in general. So how you feel about the whole show may depend on how you feel about that gap. If you're unfamiliar with these masterly tales - or what makes them so special - then you may be thrilled to see Baryshnikov (still a charismatic, if elfin, presence) making a brief nod to Tharp's Sinatra Songs, or tumbling with startling grace down a flight of stairs. Likewise you may be impressed by the haunted-house imagery from media designers Jeff Larson and Keith Skretch - the set that bristles with televisions, the bed curtains that flicker with hallucinations, the live and prerecorded videos playing above, below, and behind the actors; like The Grapes of Wrath, this show is a kind of onstage-immersion in YouTube. But it may also slowly dawn on you that all this is beside the point. The essence of a Chekhov story is the simplicity with which it suggests great depth. The prose is deceptively artless, the voices are slightly flat; the characters are immersed in quotidian demands, in the day-to-day; they age, they ache, they comment on the weather, or something they overheard someone say. And then as they have their coffee one morning - as someone once noted - their lives are destroyed. In "Man in a Case," for example, the petty killjoy Belikov, who is obsessed with constraints and rules - and making sure his neighbors abide by them - finds he suddenly has a chance at love, but is broken by the humiliating exposure that comes with it. Likewise, in "About Love," a lonely bachelor describes his long (and mutual) infatuation with a married woman; for years they shared a platonic passion - until one day her husband was transferred to another government post, in a distant province. And their lives were destroyed. As you may be able to discern from these samples, the sting of one of these stories is not easily forgotten. 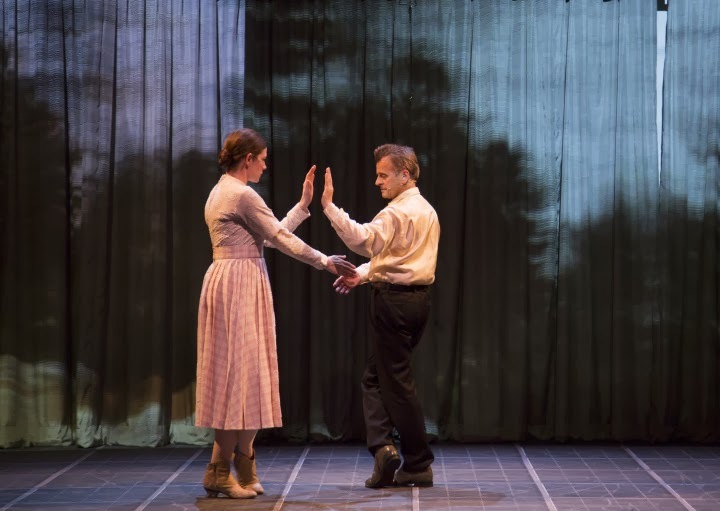 But the Big Dance Theater folks - and Baryshnikov - have somehow gotten the impression that the master's tone is arch, and that he is best served by phantasmagoria, or high-concept choreography. That's not really the case - but we go along for the ride, because of course it's fascinating to watch Baryshnikov (and wonderful to see him still working out new ways to contribute to the stage) and the rest of the cast is clearly talented. Leading lady Tymberly Canale is a particularly radiant presence, and together she and Baryshnikov almost make the case for postmodern dance as theatre (above). Almost - particularly in "Man in a Case," which may be mistaken in its idea that Chekhov's main concern is surveillance (and which, frankly, is also overstuffed with Wooster Group mannerisms), but which is engaging and inventive, at least within the parochial limits of downtown New York theatre. "About Love," however, is more or less a loss (alas), with only one or two resonant images, and a long dance - partly viewed on video - that eventually feels mannered and abstract. And tellingly, the performance is often at its most affecting when the actors simply pick up the Chekhovian text and begin reading aloud. Years before the modernists, this Russian master was telling us that less can be more; Big Dance Theater might take that maxim more to heart.